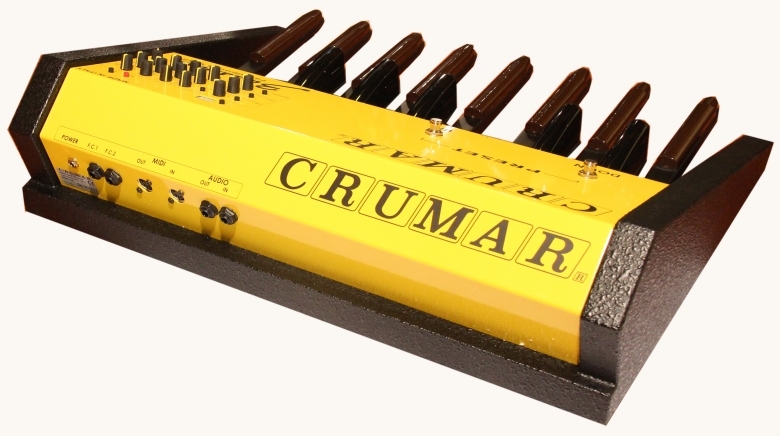 Surely, Crumar is worlwide famous for keyboards and organs made in the seventies. 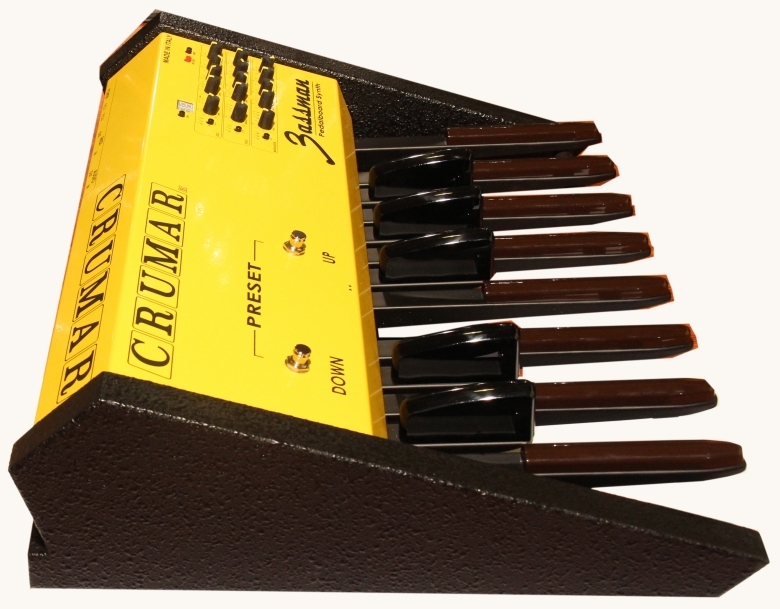 But Crumar made great synthesizers too, like DS2, Spirit and Bit One. 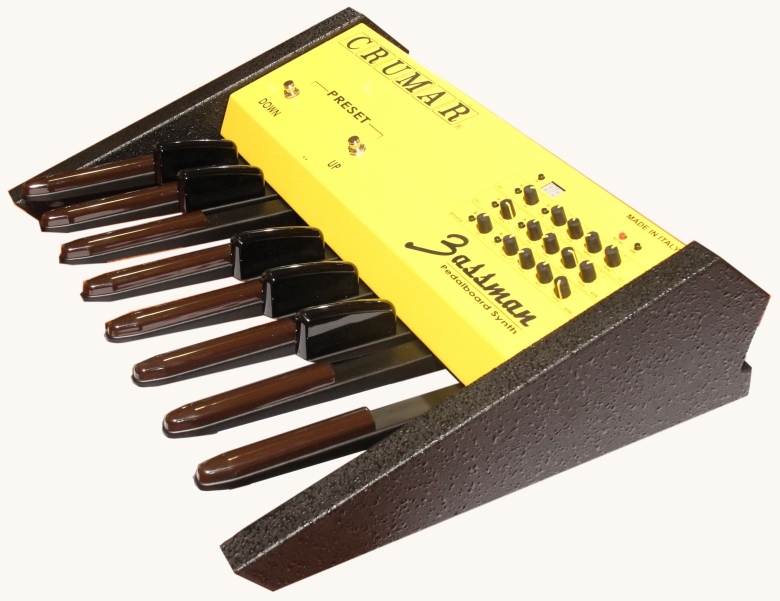 Crumar Bassman follows the teachings of its famous brothers. 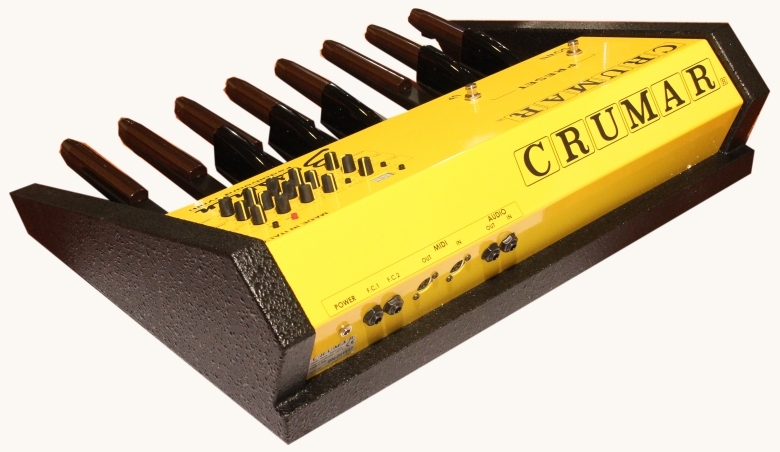 Crumar Bassman is a monophonic 13 notes synthesizer with an integrated 32 step sequencer capable of real "fat" sound, the sound you need for make music by the likes of Rush, Genesis, Led Zeppelin, Police and many others. 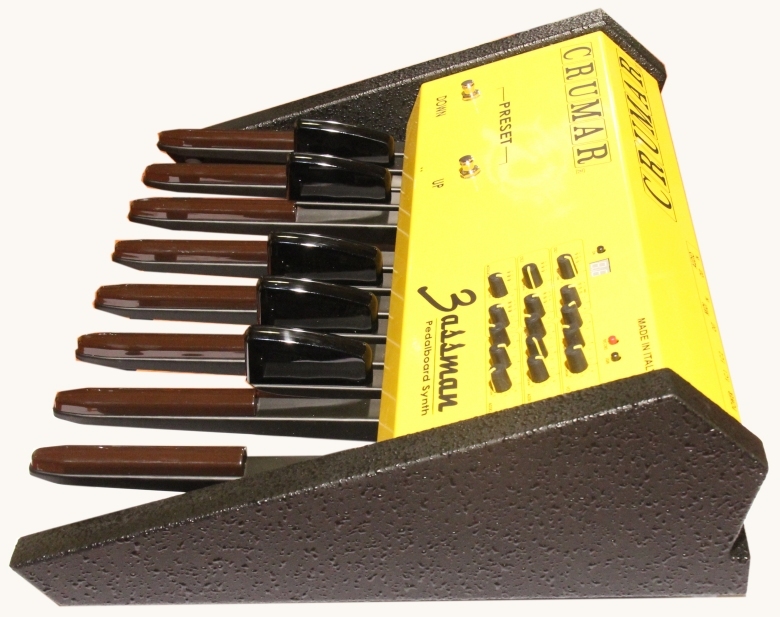 All you need is here: self oscillation, square sub-oscillator, octave selector, detuning, and glide function and this in a 100% midi capable instrument for connection to modern systems. 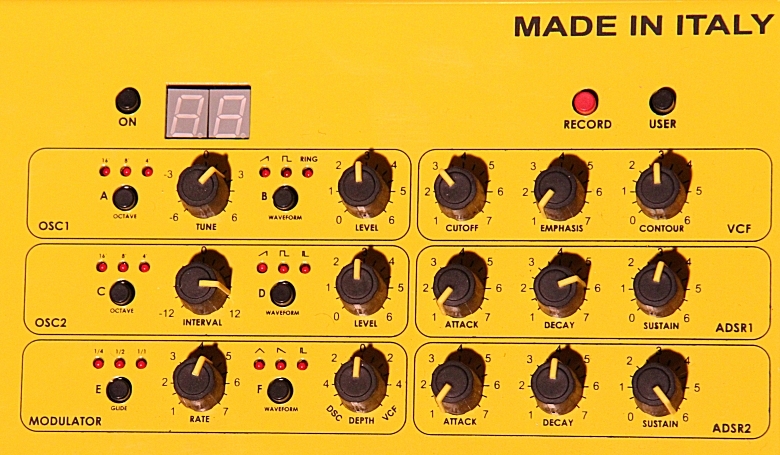 You can create your sound with 3 oscillators and recall it with the integrated panel or using the program change buttons footswitches, control the amplifier or the filter with an external pedal or with the velocity option, use the glide function for realistic synth sound and connect external source directly to the filter; Small, modern, easy... all you need is in this little yellow beast! 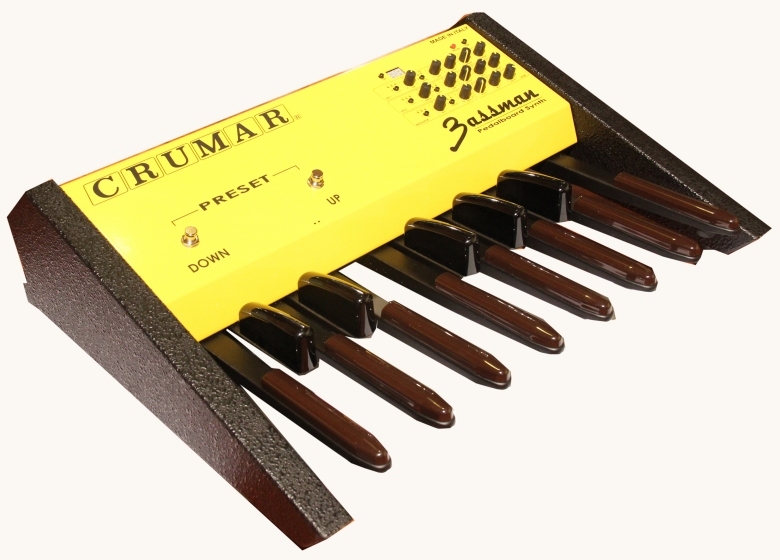 Crumar Bassman is a modular system, an advance midi pedalboard and a synthesizer all in one. You can select your midi channel and the midi behaviour of the instrument, to let you use it also like a desktop instrument or a desktop sequencer or for use it like a normal midi pedalboard on midi channel 3. It all starts with the 13 notes velocity sensitive bass pedals that let you easily play the instrument together with the two footswitches for increase-decrease programs: this is for your stage use. Talking about the synthesizer itself, it is powered by 2 oscillators (sawtooth, square, impulse waveform) and 1 square suboscillator, it is capable of self oscillation, detuning, dedicated enveloper generators, ring modulator , sync, LFO, glide and analogue voltage controlled amplifier. It has 83+83 user sound memory locations for store your sounds and a programmable sequencer with 20 locations.